We recommend working through the examples in order as the individual sections aim to be void of redundancy. SMART is enabled by default but can be disabled by setting a parameter when creating an AR.InstantTracker with the smartEnabled option. The behaviour cannot be changed during runtime. To enable ARCore with Wikitude follow the instructions in the documentation of ARCore in the section Enable ARCore. This can also be seen in the examples app. AR.hardware.smart.SmartAvailability.INDETERMINATE_QUERY_FAILED The query failed for some reason. Try again or create the tracker to run without ARCore. The callback will not be invoked again. AR.hardware.smart.SmartAvailability.CHECKING_QUERY_ONGOING The query is currently ongoing. No action is required. The callback will be invoked again. AR.hardware.smart.SmartAvailability.UNSUPPORTED The device does not support ARCore. Create the tracker to run without ARCore. The callback will not be invoked again. AR.hardware.smart.SmartAvailability.SUPPORTED_UPDATE_REQUIRED The device does support ARCore, but the companion app needs to be installed or updated. Create the tracker to start the installation process. The callback will be invoked again. AR.hardware.smart.SmartAvailability.SUPPORTED The device does support ARCore and the current version of the companion is already installed. Create the tracker to run with ARCore. The callback will not be invoked again. Be careful not to create the tracker twice when an installation of the ARCore app is required. You may receive the AR.hardware.smart.SmartAvailability.SUPPORTED_UPDATE_REQUIRED constant followed by the AR.hardware.smart.SmartAvailability.SUPPORTED constant, but will want to only create the tracker once. The snippet presented avoids doubly creating the tracker by checking its reference. Switching from initialization state to tracking state may not always be possible when platform assisted tracking is active; it requires a plane as a precondition. This may take several seconds. Should an attempt be made to switch the state without the underlying algorithms being ready, an error will be raised though the error callback. The instant tracking algorithm requires another input value to be provided in the initialization state. Specifically, the height of the tracking device above ground is required in order to accurately adjust the scale of augmentations within the scene. To this end, the three examples feature a range input element that allows the height to be set in meters. When platform assisted tracking is active, the device height above ground input parameter, and consequently the corresponding range input element, only affects the scale in the initialization state; the scale for the tracking state is automatically determined by the platform tracking algorithm. Setting this value correctly is still advised, as an incorrect value will cause a discrepancy of scale when switching between states. During the initialization, another parameter can be set which influences the alignment of the instant tracking ground plane. This ground plane is represented by the initialization indicator and can be rotated in order to start instant tracking at e.g. a wall instead of the floor. Please refer to the API reference for detailed information. When platform assisted tracking is active, the tracking plane orientation may not be altered. Doing so will, however, not have any side effects other than raising an error through the error callback. The Basic Instant Tracking example provides a minimal implementation of the instant tracking algorithm. It introduces the two essential classes AR.InstantTracker and AR.InstantTrackable. If you are familiar with image tracking already, they should seem familiar to you as image tracking uses the same pattern with its AR.ImageTracker and AR.ImageTrackable. An AR.InstantTracker can, minimally, be instantiated without any parameters. It, however, allows an initial height to be specified (deviceHeight) as well supply a callback function to be invoked when a transition between states occurs (onChangedState). An AR.InstantTrackable can, minimally, be instantiated with just the previously generated tracker instance, although supplying drawables to be rendered in both the initialization state and the tracking state is advisable for any practical use case. Therefore two AR.ImageDrawable instances and, correspondingly, two AR.ImageResource instances are generated and supplied as well. When using SMART and platform assisted tracking is supported it is only possible to start tracking once ARKit or ARCore have detected a plane. Because of this it is advisable to add a third AR.ImageDrawable to indicate when it is possible to switch from initialization to tracking which can be checked with AR.InstantTracker.canStartTracking. The only additional change required is a means to transition from one state to the other. For this task we provide the changeTrackerState function which we conveniently call on a button click. The AR.InstantTrackerState defines the two values used to identify each state. Lastly, we provide the changeTrackingHeight function to set the deviceHeight property of the AR.InstantTracker and connect it to our range input element. 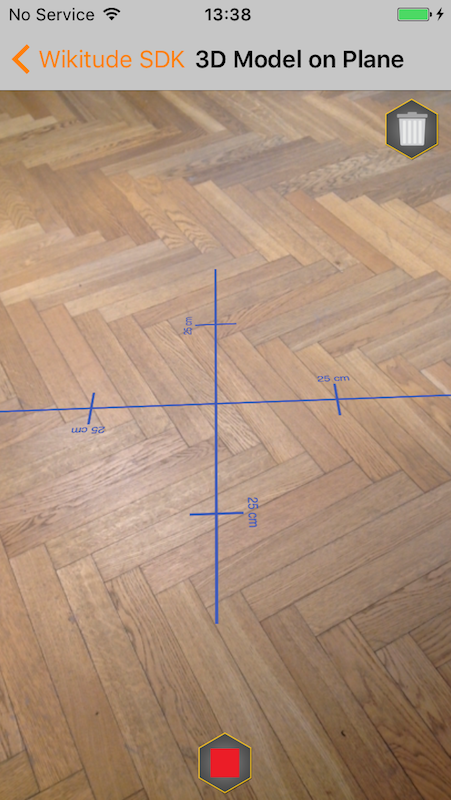 While this change is, strictly speaking, not required, we strongly recommend every application to supply the device height accurately by this method or another for the Wikitude SDK to provide an accurate scale. In this section, the example application implemented previously is amended to demonstrate user interaction and the use of more sophisticated augmentations. Firstly, we extend the application by allowing 3D model augmentations to be placed within the scene by simply clicking on the screen. Internally, the ray defined by this touch is intersected with the instant tracking plane, yielding an intersection position that can trivially be applied to the models transform property. Upon this occurrence, the onTrackingPlaneClick callback of the AR.InstantTrackable is invoked and the intersection position coordinates are supplied as separate parameters. 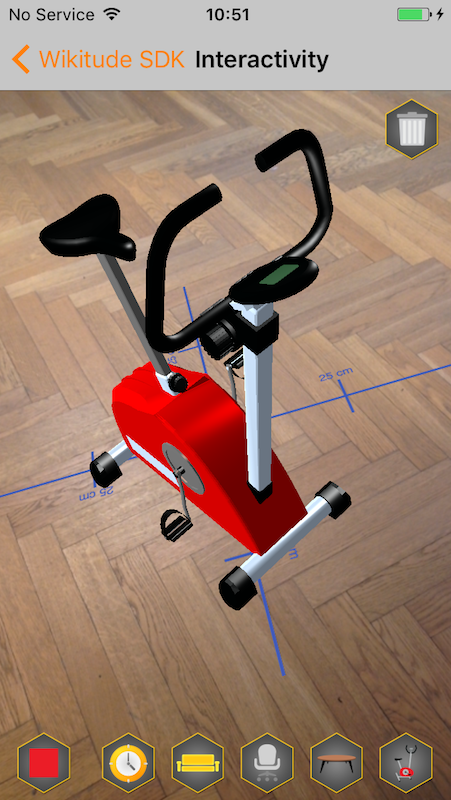 The addModel function instantiates an AR.Model and sets its initial scale, translate and rotate properties. Note that the translate property is directly set to the intersection coordinates passed into the onTrackingPlaneClick callback. To add some visual variety, the rotation about the Z-axis is randomized. The isTracking function simply checks whether the tracker is in the tracking state to limit the user interaction thereto. The example further includes functionality to reset the generated models, which is omitted as it does not directly pertain to instant tracking. Lastly, we further extend the example application to allow several different AR.Model augmentations to be placed and introduce gestures that allow alteration of previously placed augmentations. To begin with, we add several buttons, one for each available model as depicted by the very first pair of images at the beginning of this page. As the HTML definition thereof is straightforward, it is omitted here, yet it is required to be aware of their presence for future reference. More importantly, we initially setup event listeners such that the touchstart event is triggered on each of the buttons, which we utilize to set the requestedModel property. This property indicates which model to instantiate. In order to instantiate models, we further implement the onTrackingPlaneDragBegan, onTrackingPlaneDragChanged and onTrackingPlaneDragEnded callbacks of the AR.InstantTrackable. The began and end callbacks are invoked when a one finger drag is initiated or lifted respectively; the update callback is invoked periodically as long as the gesture is continued. As with the onTrackingPlaneClick callback, they do get the intersection positions of the touch ray and the instant tracking plane supplied. We simply forward the intersection positions to the updatePlaneDrag function which checks the requestedModel property, which might have been previously set by the touchmove handler function of one of our buttons. If that is the case, a model of that ID is created at the supplied intersection position using the addModel function. The subsequent onTrackingPlaneDragChanged calls update the position, allowing our AR.Model instances to be created by dragging them from the buttons we created previously. One more intricacy to consider is disabling the drag gesture while two finger gestures are active in order to prevent counterintuitively behaving transformation interactions. This can be achieved by implementing the AR.context.on2FingerGestureStarted callback and setting a flag therein. The onDragChanged callback is adapted to consider this flag and only update the translate property when allowed to do so. The flag is reset in the next onDragBegan callback invocation to re-enable. 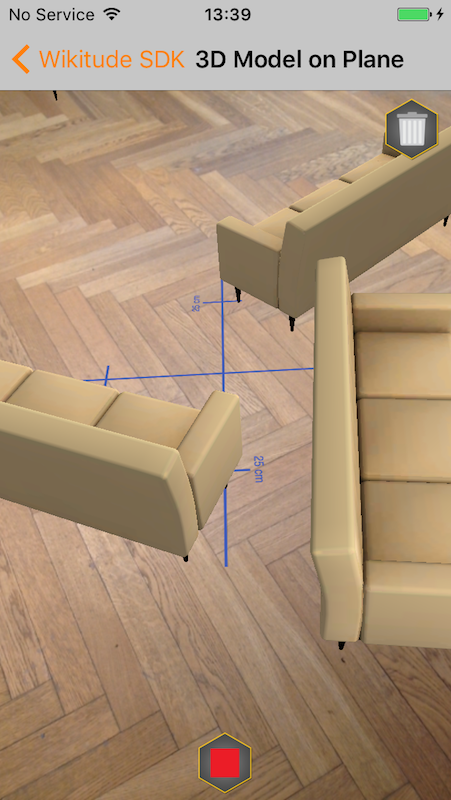 The changes outlined finally enable the initial use case of a furniture product visualization application to be implemented. Again, there are aspects of the example app that have not been covered, but they do not directly relate to the instant tracking feature and can easily be understood from the source code of the example application. 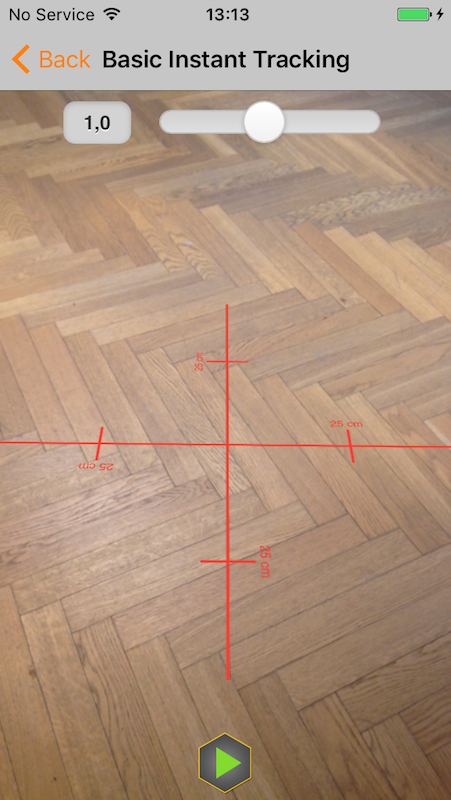 The instant tracking feature further allows for 3D points to be queried from the underlying point cloud structure. This section is concerned with showcasing this feature based on the corresponding sample of the sample application. To utilize this feature a 2D input position on the screen is required. To acquire this position, we utilize the AR.context.onScreenClick event and attach a function receiving the click coordinates as its input to it. The coordinates received can be supplied to the convertScreenCoordinateToPointCloudCoordinate function of an AR.InstantTrackable unaltered. In addition to the input coordinates, the function requires another two functions that are invoked upon completing the query. These function are called upon success and upon failure respectively. Success meaning a 3D position could be found for the input coordinate, failure meaning such a position could not be found. 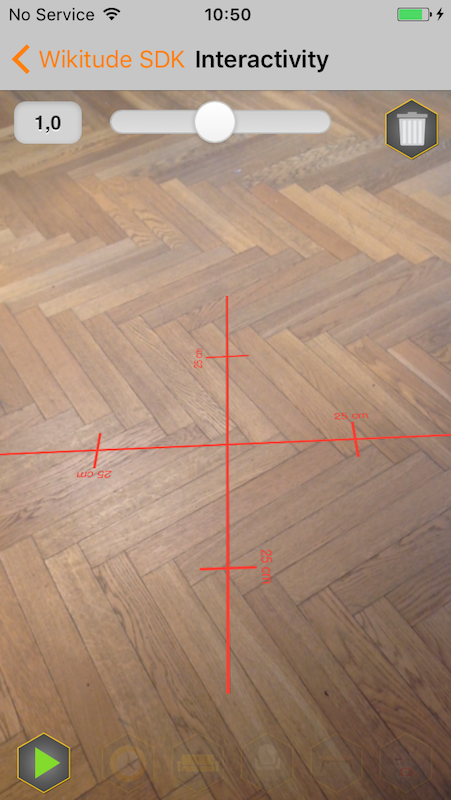 For the successful case, the resulting 3D position is provided as three separate parameters. 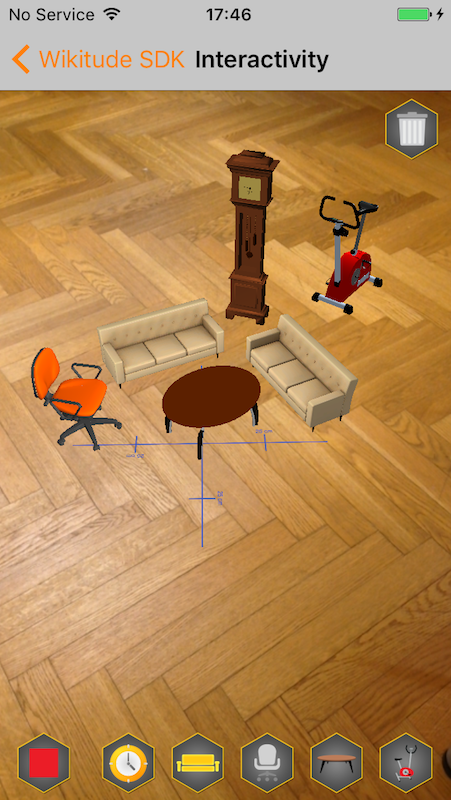 These can be used to set the translation of any AR.Drawable directly; a AR.Circle in this case. This feature is only available in the tracking state. 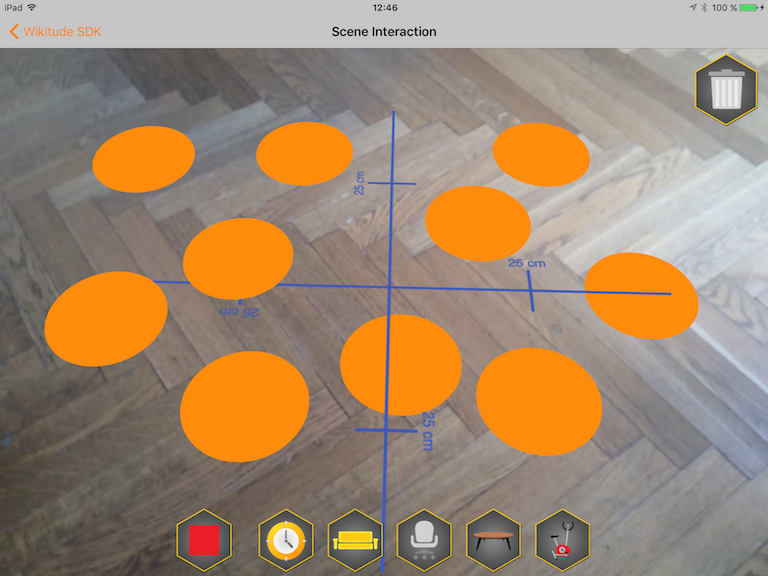 Finally, running the sample allows circle augmentations to be placed on screen touch when in tracking state. To save an instant target there has to be an active InstantTracker in the tracking state and the directories of the provided path have to exist. saveCurrentInstantTargetToUrl is called from the platform code with a url which is then used as path for saveCurrentInstantTarget to save to. To load an instant target there has to be an active tracker and a previously saved instant target. loadExistingInstantTargetFromUrl is called from the platform code with a url which is used to create a TargetCollectionResource that is then used by loadExistingInstantTarget. In the example, when loading the instant target was successful, the previously saved augmentations are recreated. Implementation details for the save/load instant target example are located in the WTAugmentedRealityViewController category SaveAndLoadCurrentInstantTarget. The URL to which the instant target shold be stored to is generated each time as shown in the following snippet.